But was it really fiction? He inadvertently opened a door, one that would soon jeopardize the lives of his family. She wants to come back. At home, his wife struggles to keep their family alive. Secretly wondering if she caused it all…a deal she made long ago. A deal with the Forsaken. The eager fire licked at the leather binding, reaching around the journal with the hungry tongue of an unfed child, engulfing the pages within a muddle chaos of orange and red. The logs crackled and popped with excitement. Smoke bellowed forth, thick and dark, choking the surrounding air. When he opened his eyes, he stood alone in the parking lot under the unforgiving storm. For the first time since wandering out into the night, the rain chilled him. The knife clattered to the blacktop, and he wept. "You need to focus, Thad, for your family's sake. They're running out of time. Their blood will be on your hands if you fail us, if you fail Her." "When I saw her story, as I put her story to paper, I saw only death behind her and a fierce hatred in her eyes. She has no love in her heart, no compassion, only this deep, dark hatred. If you see anything else, it's only because she's blinding you - using you to get what she wants." Around us, many eyes glowed in the moonlight, weary and bright as the forest creatures looked on from the safety of darkness. They didn't follow though, and I couldn't help but wonder if we should take heed from this. I've been in the mood for a good horror story lately. I just haven't found one that hasn't had be rolling my eyes in annoyance. Enter Forsaken by J.D. Barker. Introduced to me as a novel that was "short-listed for a Bram Stoker Award," I knew I couldn't pass up the opportunity to read this. I have an affinity for novels that start out with a bang, especially when they're horror stories. Our first introduction to Her is when she is haunting the dreams of Rachel, telling her time is running out and She's coming for the baby. Immediately She is creeping me out. The way J.D. writes about Her is so commanding we don't need her to actually be present to be terrified. Sprinkled throughout the novel are excerpts from Thad McAlister's newest novel Rise of the Witch. These excerpts give us a bit of a back story regarding Her and, along with the experiences of Thad and Rachel, we soon learn that maybe She isn't just a figment of Thad's imagination.While these excerpts aren't scary, they add to the atmosphere of Forsaken and create a rounded out story. One of the things I really appreciate in Forsaken is that the horror isn't constantly in your face. There are moments of big bang horror, but there are also moments of "There's a possibility this is all in my head." Overall, the horror bits are gradual and slowly build over time and these people learn too late that they are in some serious trouble. That dream wasn't simply a dream. The grass dying wasn't simply the grass dying. This book isn't simply just a book. The characters are realistic and flawed with fantastic pacing, a dark atmosphere, and nail-biting tension. There are witches, dirt minions (which are creepier than they sound, I promise! ), and maybe a possession or two. J.D. 's masterful storytelling pulls readers into this story and is guaranteed to give you the heebie jeebies, even long after you finish. Welcome to Bookish, J.D.! I'm so excited to have you here with us today! It's no secret that you pulled from the Salem Witch Trials for Forsaken. How much research did you have to do to make the excerpts for Clayton Stone's journal authentic? The Salem Witch Trials are one of the most fascinating and horrific events in our history. When I first started research, I had a basic understanding of what happened but it wasn’t until I delved into it that I began to see the full picture. I searched court records and eventually took a trip to Salem. I wanted to walk the streets where this happened. Because the town has embraced its history, many of the original structures are still intact and there is a certain feeling of stepping into the past as you pad along the cobblestone and look up at the old houses and buildings. I couldn’t help but wonder if Thad McAlister would have made a similar trip, what would have gone through his mind. Each of the characters in Clayton Stone’s journal can be traced back to real players in the actual witch trials. There was a young man tasked with documenting the events. The accusers held court as the magistrate presided. The innocent were imprisoned and tried while their friends and family watched on. It was a brutal perversion of our legal system and it happened right here, not that long ago. It reminds us of just how fragile our society can be. All of this started when a group of young girls ranging in age from 9-11 claimed to be possessed by the devil and accused several local woman of witchcraft. Things escalated quickly. Bridget Bishop was hanged that June. Five more were hanged a month later, another five that August. Eight others died in jail awaiting trial. Before it came to a conclusion, more than 150 men and women were accused. So many deaths, all triggered by the words of handful of young girls. I can’t help but wonder, could it happen again? Not necessarily witch trials but the modern day equivalent. Imagine how quickly something like this could spread in our connected world. What is the weirdest thing you came across during your research? Bridget Bishop (the first to be accused) had been accused of witchcraft earlier in her life by her third husband. Most likely rumors followed her throughout her life. None of the guilty were burned at the stake, this twist was most likely added by Hollywood. Giles Corey refused to plead guilty or not guilty. The court found him guilty and he was pressed to death with large stones. In 1484, Pope Innocent VIII issued a papel bull that recognized the existence of witches. What was your reaction upon learning you were a top finalist for the Bram Stoker “Superior Achievement in a First Novel” Award? What does that mean to you at this point? Also, congratulations! Thank you! It’s a huge honor. I’m in the same category as David Cronenberg (The Fly, The Dead Zone, Scanners and so many others), and Josh Malerman (who just received a film deal with Universal for Bird Box). Past winners include J.K. Rowling, Robert Bloch, Ramsey Campbell, Thomas Harris, and Stephen King. To be in this kind of company cannot be expressed in words, particularly with my first novel. Wow, that’s tough. I’m still amazed so many people have read something that existed only on my MacBook a year or two ago. I’ve received drawings of the witch from all around the world. One reader in the UK painted a picture of one of the minions on glass. A group on GoodReads has begun a letter writing campaign to the movie studios in hopes of kickstarting a film. I am so grateful people are reading it and thrilled with the feedback I’ve received. All of it fuels the fire and pushes me to continue and improve. The work of Stephen King is, to say the least, a clear influence in Forsaken. Can you talk more about how his work has affected you, and the decision to weave it into your original world the way you did? Anytime you find a book that captures the attention and draws you in so deeply you forget your surroundings and find yourself engrossed in the story, it’s a magical thing. Many authors strive for it, only a few are capable of achieving it. To do it repeatedly is even more elusive. Stephen King has done it time and time again for more than forty years. I have a tremendous amount of respect for him, his work, and all he has achieved in both print and film. When I wrote Forsaken, I had to explain where Rachael obtained a journal integral to the story. In my mind’s eye, I could see her walking into a particular store and purchasing it from a particular gentleman, both of which I first encountered within the pages of a Stephen King novel. I went ahead and wrote it as I saw it, fully expecting to have to change everything long before publication. When King actually granted permission for me to leave it as is, I was thrilled. (Andrea's note: How freaking cool is it that Stephen King gave him permission to do this?!) I knew it would be fun for readers but it also gave me a chance to pay homage to him for all the hours of enjoyment his books have provided. As a writer, particularly when crafting a story with an intricate plot, outlining is a must. However, you quickly learn the characters may have a very different idea of just where the story should go. You can either try to hold them on course and force them to follow the outline, this predetermined path, or you can follow them. With Forsaken, the characters had my ear until the very end. Rachael wanted to walk into that particular store. Was it the right thing to do? As I read the reviews, most seem to love it. There are a few though who raise their hand and call foul—Publisher’s Weekly was critical of it. They seem to be in the minority though. Ultimately, I got to write the book I wanted to write. Those who come before us are not only our influences, they are our teachers, our guides, our mentors. In my case, that list includes Stephen King, Dean Koontz, John Saul, Neil Gaiman and many others. King has cited Ray Bradbury, Richard Mathenson, and Robert Bloch as some of his favorites. In turn, they have named the likes of Poe, Lovecraft, and Orwell. With the advent of eBooks, we live in a very unique time. The works of all these greats are readily available; they all have something valuable to say. As they each take their turn teaching Fiction 101, I’m sitting in the first row with my notepad at the ready. Do you have any real-life spooky stories to share with us? Any supernatural experiences or blood-chilling encounters? My childhood home was a large English Tudor set in the center of a forest. Surrounded by ancient oaks, the rest of the world vanished as you followed the driveway through the trees and up the hill to the house. As children, when we stood at the bottom of that hill, it felt as if the house were staring down at us. It held a life all its own, an energy. We never considered it to be haunted—my father had built it himself so there was no history to feed our fears but yet there was…something. It took about two years before the first neighborhood child told us about the Woman in the Woods, a strange apparition in white spotted by adults and children alike walking through the forest where our house now stood, sightings dating back more than forty years. Nobody knew her name or why she was there but you were hard-pressed to find anyone in town willing to deny she was there. My sister and I turned our fear from the interior of the house to the woods outside our windows and for nearly a year we’d take shifts through the night, watching, waiting. On my eight birthday, we had a slumber party with about a dozen of our friends and I was dared to walk to the center of the forest and back, by myself, at exactly midnight. I knew I couldn’t back down, but I was terrified. We all snuck out through the basement and I was sent on my way with a flashlight and the murmur of my friends at my back. Whether just a child’s overactive imagination or real, I’ll never know, but the things I saw that night followed me back out and continue to find their way into my writing today. What's the scariest / most memorable horror movie you ever saw? Book you ever read? The Exorcist by William Peter Blatty. I had seen the movie numerous times but that could not have prepared me for the novel. The visuals brought forth by this book are so vivid, I found myself lost within the pages and tore through it at a feverish clip—cover to cover in about six hours. Blatty masterfully dances between horror, detective story, and theological thriller. This in particular stuck with me since most novels are squarely fixed in a single genre. It’s a skill I’ve attempted to weave into my own writing. 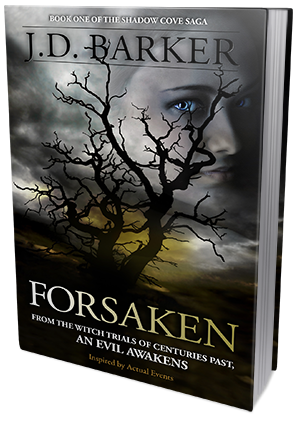 Forsaken is equal parts horror and suspense with a touch of history. With my next novel, The Forth Monkey, I’m attempting to combine the fast paced action of a thriller with the suspense of horror. In Ghost Story, Peter Straub referred to such a novel as a “Chiller”. I like the sound of that.